With just days left to go in the mayoral race, Joe Pantalone, Rob Ford and George Smitherman are locked in a battle for their political lives. Smitherman's taking every opportunity to appeal to Pantalone's peeps: vote for me or you'll be responsible for letting Ford, that bumbling throwback to Mel Lastman, win. But he's wrong about that: if Ford wins, it'll be because he convinced enough people to vote for his idea of what Toronto should be. I never want to live in Obion County, Tennessee. That's where the fire department wouldn't save the a local family's home because they had forgotten to pay a $75 "subscription fee" for fire services. The firefighters showed up because a neighbour's property was at risk - the neighbour having paid the fee - but stood by and watched the Cranick property burn down, including three dogs and a cat. Even leaving aside the issue of the trapped animals (and I dearly hope that there is some SPCA-type organization out there looking into whether this fire service is culpable), I never want to live in a place where, as the reporter says at the end: "Despite this incident there are no plans to make the fire subscription fee mandatory, like a tax." Toronto's election this time around has been about city spending which is another way of saying it's been about taxes. As the field of mayoral candidates has shrunk, this has become more obvious than ever: we're watching the three remaining serious contenders fight over two competing visions of municipal services. We can have a great city that provides an array of different services that we may all use at different points in our lives, or we can have a city where services are pared to the bone and run on the cheap. The truth is - and I say this as someone who's spent hours reading election coverage, looking at policy and listening to Joe, Rob and George at debates - the truth is that we can't have both. 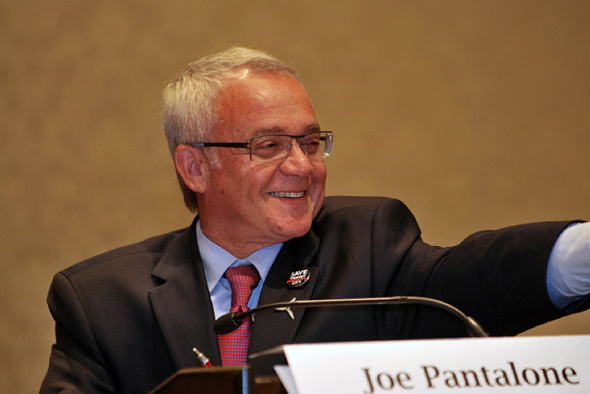 Joe Pantalone is the only man standing who still believes in what I'd call the great city vision. While it may be fashionable to attack David Miller's legacy and mock Pantalone for wanting to carry on with his civic - and civil - policies, we should take a moment to remind ourselves that it is under Miller's watch that we became a city that is consistently ranked among the most livable in the world. Rob Ford's numbers may not add up but at least he's open about what he wants - a Toronto that's neatly and cheaply accessible for suburban commuters, without the innate mess and fuss of streetcars, pedestrians and bicyclists. In my opinion, this is a path that eventually leads to Obion County, Tenn., where obviously you get to pay for the services you decide you want and woe betide you if you discover too late that you obviously need a service you didn't - or couldn't - pay for earlier. While George Smitherman may be more polished and urbane, he's not that different from Rob Ford in terms of policy. Ford's says he's going to "find" billions in savings which will presumably be returned to us taxpayers; Smitherman says he's going to freeze property taxes, at least for 2011. There's no way around the fact that will mean less money will be spent on the things like transit and libraries and retirement homes. Ford's going to replace retiring city workers at the rate of 1:2; Smitherman's going to do it at the rate of 2:3. Either way you slice it, that's fewer people working for the city and fewer people delivering services. 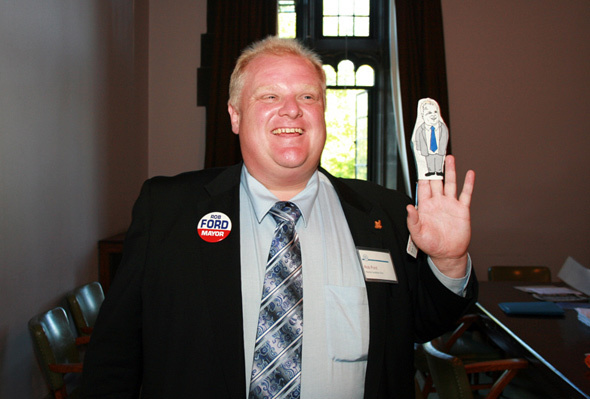 As I see it, there's no strategic voting option here: I would as soon vote for Ford as I would for Smitherman. And it isn't just me: political watchers as disparate as Royson James and Gord Perks have come to the same decision. I suppose you could consider voting for Pantalone if you're a soft Smitherman supporter who just wants an urbane, nice guy to be the face of Toronto. Me, I'll vote on the principle that I like the services I get from the city - the TTC, my Toronto Public Library library branch: the Lillian H. Smith, the parks around me, especially Trinity Bellwoods, and, though I've never had to call them, EMS and Fire. I want to make sure that they'll be around if I ever need them. And that they will be paid for through my taxes and yours. I'll vote for taxes that equalize the cost of services across us all and not for "subscription fees" that allow some of us to buy what most of us should have but can't afford. In other words, my vote will be for a vision of a city that is greater than the sum of all its residents. If Pantalone wins, I'll be ecstatic. But if it's Ford or Smitherman, I can live with it: my vote will still hold out hope for a kinder, gentler city than the one that they both want to deliver. My vote will be one of thousands that will help those progressive Councillors who get elected - and yes, there will be some, no matter who becomes Mayor - to fight harder and longer for a better Toronto for all. Photos from sniderscion, Joe Pantalone's Flickr page and Shaun Merritt.